When a property is bought by someone the owner of the property who is selling it gives an affidavit stating that he or she is unaware of any kind of liens or claims that may be pending on the property. This is known as the owner’s affidavit. This affidavit may also be used to disclose any kind of problems that are associated with the property in question. 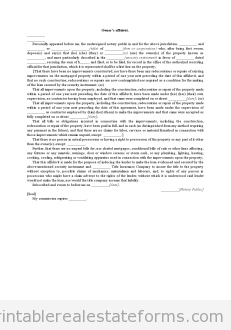 This is basically a sworn statement that announces to the buyer the problems of title of any other defect associated with the property. This affidavit proves that the property in question is actually owned by the seller and he is the sole title holder of the property. The affidavit also declares that the property is not in the process of being sold to another party, the property has no liens associated with it and there are no associated bankruptcy proceedings on the seller. This affidavit is meant to protect the buyer of any fraudulent activities associated with the land deal and that may cause problem for the buyer in the future when the deal is closed. The owner’s affidavit must contain the declaration by the seller that he is the title holder of the property that is being sold as well as about any kind of lien that is pending against the property in question. The seller must declare that the property is not in any mortgage and that there is no judgement that is pending as far as the property is concerned.